Is there a way to draw Interruptible Activity Regions on Activity Diagrams with Astah? Interruptible Activity Region is not available on the tool bar. 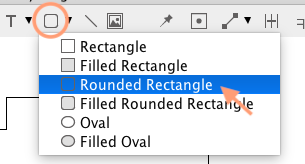 So to represent it in Astah, please use the free shape - rounded rectangle. 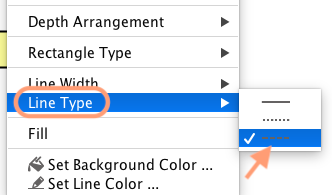 (1) Choose [Rounded Rectangle] from tool bar. (2) The shape appears on the diagram. By default, it appears as a solid line. Right-click the rectangle and go to [Line Type] and select dashed line.